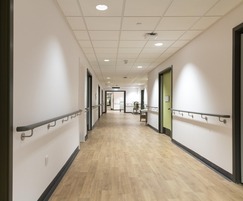 Completed in 2018, the £35m Stirling Care & Health Village development integrates health and social services within two new purpose-built facilities: a GP and Minor Injuries Centre housing a range of health services; and the Bellfield Centre, providing short-term care and rehabilitation for older people, as well as support for patients with dementia and those requiring palliative care. 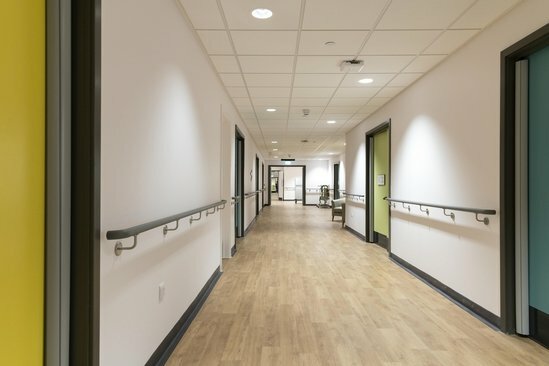 The design of both facilities includes a wide range of features making them dementia-friendly; from a clear, spacious layout and inclusion of green areas and community spaces, to interior design elements supporting reminiscence therapies and wayfinding. 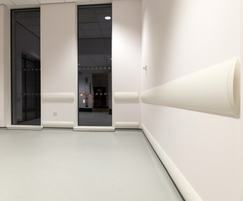 A range of Acrovyn wall protection solutions was used in both facilities to help maintain them to a high standard. 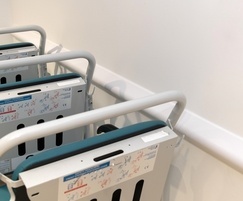 In the Bellfield Centre code-compliant handrails were specified for all circulation areas to offer necessary support to frail patients. Impact-resistant sheet was applied to walls behind beds in all en-suite rooms, while corner protectors and crash rails protect external corners and parts of walls in areas where impact damage from equipment was anticipated. 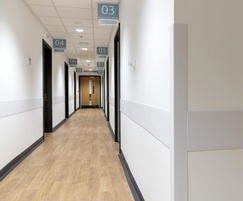 Throughout the corridors and waiting areas of the GP and Minor Injuries Centre, rub rails protect mid wall areas from wear and tear, and corner guards offer effective damage protection to vulnerable external corners. In addition, medium-duty crash rails were used in equipment storage and resus areas to prevent damage caused by equipment. 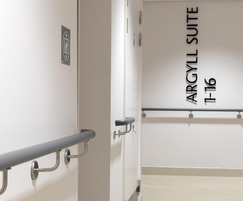 Installed by Conspec Contracts (CS’ in-house installation team), Acrovyn products help to provide a clean, safe and supportive environment and protect interior surfaces from damage, reducing maintenance costs.